The Eurovision song contest is a European event that has allowed some countries outside of Europe to compete, hence the waving of the EU flag at virtually every event connected to it! The leave process so far has hit my pocket for the tune of fifteen hundred quid, EU membership cost around forty a year. 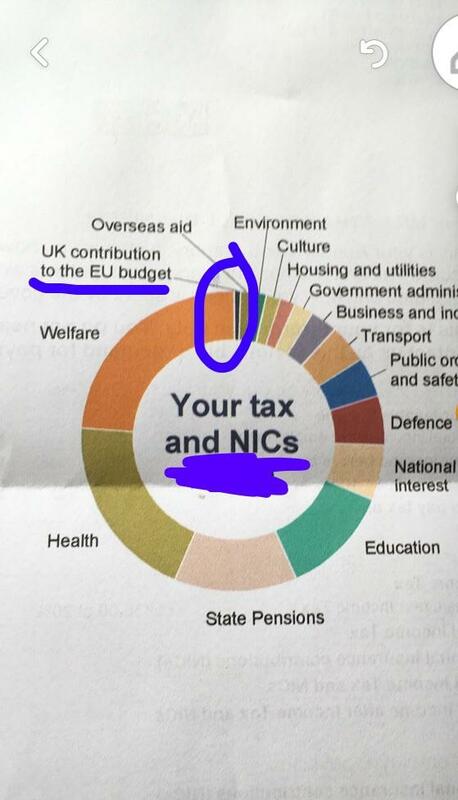 Stooo wrote: I got my tax code notice today from the revenue and as usual there's a breakdown of where my taxes were spent on the back, the smallest amount by far was to the EU. A poster on another forum worked it out at a mere few pence per person a week. Eurovision has nothing to do with the EU. Net 9 billion goes to EU from UK taxes....So A FEW PENCE IS WILDLY inaccurate. More like 200-500 pounds for real taxpayers with real incomes(not rich not poor). No Tom the figure per person is actually quite small. If i find the post i will quote it for you but he'd done the figures. We've also benefited hugely from EU funding over the years and i'm not just talking of buildings either but things like scientific research which will be a massive loss. Just listen to this muppet Brexiteer clash with James O'Brien after he called in to the radio show today declaring the Seaborne ferry contract is still in place! When James asked where he had this information from the caller goes off on a wild rant into deflection mode before insulting O'Brien and slamming the phone down! All the hallmarks of a Brexiteer in denial! I earn above UK average wage, it's less than forty quid a year according to my personal breakdown. So 0.19p a day...less than half a pence a day and even less if earning below average. If anyone saw a one pence coin on the ground, most would ignore it and walk on. Tom would pick it up! Stooo wrote: Like me you mean? How could you get to a bank to deposit the money or do it online when you have just been born then? I didn't see that on the side of a bus.